Chinese martial arts display. Northern China, sometime in the 1930s. This is the first entry in what I hope will be a periodic series where we examine and discuss period ephemera (1850-1970) relating to Chinese martial studies. Ephemera is very interesting to me as it is closely tied to questions of class, identity and popular culture. It’s a valuable source of evidence as to what was going on at a given point in time, and how that was perceived by other groups. Not only does the camera lens record the past, but it also records the ways in which we frame, display and distort our collective memory. 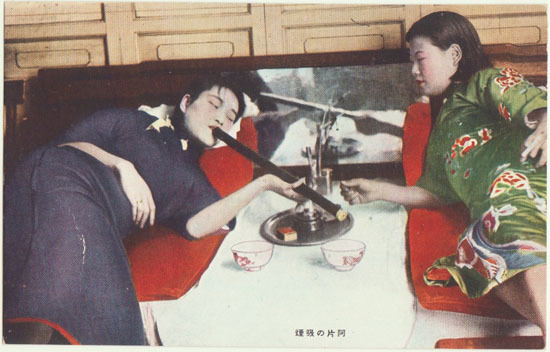 One of the largest groups of ephemera to emerge from China prior to WWII were postcards. These inexpensive items were sometimes meant for internal consumption or, more often, they were produced by Japanese, British, German, French or American firms with the expectation that they would be purchased by expatriates and sent back to the home country. Not surprisingly, the postcards produced by foreigners in the early 20th century often descend into a protracted exercise in racism and orientalism. The most common themes seen in postcards from the 1900s-1930s are attractive Chinese women, the on-the-spot beheadings of street criminals and occasionally beautiful black and white images of ancient temples, Ming era tombs and picturesque architecture. Less common (but by no means rare) cards include pictures of drug addicts, foot binding or brightly dressed opera singers. The overall message of this trade in appropriated images is clear. “The Chinese are different from us. They are lascivious, degenerate, murderous and whatever greatness their civilization possessed is now in ruins–ruins that westerns have a duty to document and preserve.” Of course nothing could have been further from the truth. The average Chinese citizen of the 1930s was very distressed by the breakdown of civic and personal virtue in places like Shanghai. The warlords of the period were ruling the populace through campaigns of terror directed at their own citizens. No one saw this violence as a model of good government. Lastly, far from falling into obscurity, Chinese society was modernizing incredibly swiftly. It managed to do in just a few decades what had taken Europe hundreds of years to accomplish. Of course no one enjoys watching the sausage of modernity being made. The one thing you don’t see very often are postcards with martial artists on them. They exist (like the one above) but they are hard to come across. This silence is informative as westerns were certainly interested in Chinese hand combat. It fit their dominant cultural narrative and boxing was a “quaint,” quintessentially “oriental,” behavior. When you go through Japanese post cards of the same period it is not all that hard to find individuals dressed as Samurai or in period armor demonstrating the traditional martial arts. 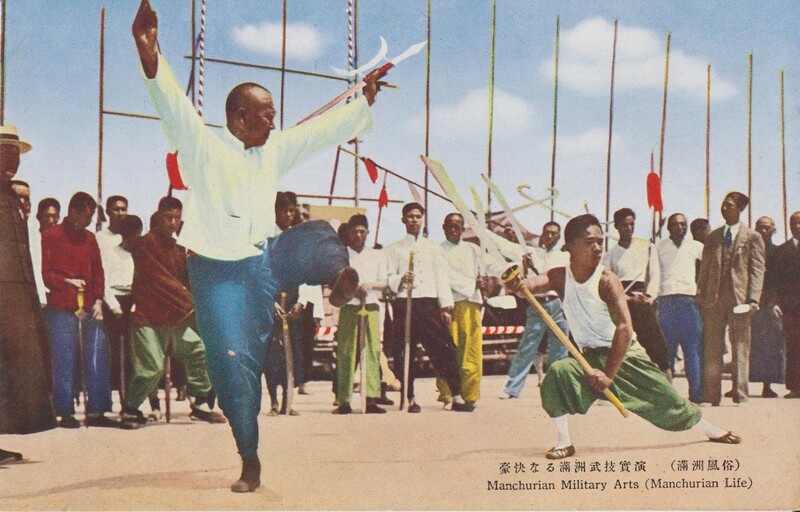 The rareness of images of martial artists in China really testifies to the cultural marginality of hand combat throughout most of the country prior to the 1980s. Of course things vary by year and location. The nadir of Kung Fu’s popularity was reached around 1900, following the defeat and national disgrace of the Boxer Uprising. Martial arts schools across the country were closed (many by local governments) at that point in time. Yet by the mid-1920s tastes were once again beginning to change. There was growing excitement about a variety of “traditional” Chinese activities, including the martial arts. Jingwu (the Pure Martial brand) sought to capitalize on this, and later the nationalist government attempted to subvert the growing enthusiasm for traditional boxing to its own ends. All of which brings us back to the image above. It records a martial arts display that was probably staged sometime in the 1930s given the style of clothing seen in the photo. This would mean that the photo was taken during the Guoshu, or “National Arts” period when the Nationalist KMT party was promoting their version of the traditional arts through centrally organized tournaments, publications and martial arts academies. Unfortunately I have not been able to identify exactly when or where this image was taken. The verso is little help in this regard. The postcard itself was produced in Japan in the 1960s and was probably an attempt to capitalize on the resurgence of interest in the martial arts that was going on at that point in time. It was marketed to both a Japanese and English speaking audience. Contrary to the assertions of so many Kung Fu films, traditional Japanese martial arts masters were certainly aware of their debt to their Chinese brethren and were often very interested in the Chinese martial arts. The interests and attitudes of real martial artists are often quite different from how they are portrayed in nationalist myth-making. In both China and Japan, government sponsored myth-makers sought to use the mystique of the martial arts as a tool to unify and radicalize the population. For much of the 20th century Asian martial culture was used to create a certain type of nationalism. This postcard seems remarkably free from such sentiments and is a valuable historical document. The weapons seen in this photograph are particularly interesting. Obviously the closest martial artist to the viewer is demonstrating the use of the Shuang Gou. These hooked swords are one of the more exotic pieces of weaponry sometimes seen in the Northern Kung Fu arsenal. Yet is should be noted that most of the weapons carried by the masters on stage are actually quite traditional. We see a horse knife, a couple of period ox-tail daos (always popular with civilian martial artists), what appears to be a Qing regulation military saber from the mid-19th century (something that would have already been an antique in the 1930s), at least four spears (one of which is quite long), multiple jians and one (comparatively rare) double handed straight sword right in the middle. This is one picture that certainly suggests a thousand stories. I wonder if there are any other postcards in this series? If anyone has any information as to when or where this picture was taken I would love to hear it.